Free Scrappage Supplement with What Car? | What Car? Free Scrappage Supplement with What Car? The Government has said 'yes' to a Scrappage scheme, and, as ever, What Car? is first to react. With this month's What Car? 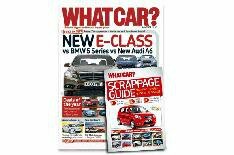 we've included a free and comprehensive Scrappage Guide supplement that tells you all you need to know about how to make the scheme work for you. We also list the 50 Best Scrappage Buys, at all budgets and across all categories, on top of which there's What Car? 's usual mix of knowledge and advice on how to choose your next car, where to buy it, and how to get the maximum discount off it. In the main magazine, we put the new Mercedes-Benz E-Class up against the BMW 5 Series and Audi A6, and we find out who gets the better deal in the showroom, men or women. UK-based consumers can order online - postage & packaging included in the cost! Click on the image below.